Over the past decade, researchers have developed a variety of reliable real-time and archival instruments to study sounds made or heard by marine mammals and fish. These new sensors are now being used in research, management, and conservation projects around the world, with some very important practical results. Among them is improved monitoring of endangered North Atlantic right whales in an effort to reduce ship strikes, a leading cause of their deaths. Van Parijs is one of many researchers whose work is described this month in the journal Marine Ecology Progress Series. Her paper is one of about a dozen in a special theme issue focused on acoustics in marine ecology. Van Parijs, who currently heads the NEFSC's Protected Species Branch, is also a co-author of a related paper on acoustic interference or masking, in which marine animals alter their use of sound as a result of changing background noise. Van Parijs and her colleagues focus on two types of acoustic sensors, real-time and archival. 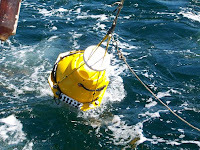 Real-time sensors are mounted on surface buoys, usually anchored or cabled to the ocean bottom, or deployed as arrays towed from a surface vessel. Archival sensors are affixed on bottom-moored buoys equipped with hydrophones to continuously record ocean sounds for long periods of time, often up to three months, before the sensors are temporarily recovered and their batteries refreshed. Some archiving sensors can be mounted of individual animals. Large whales move and communicate over great distances, while smaller whales and dolphins tend to communicate over smaller areas. Pinnipeds, the group of marine mammals that includes seals, walrus and sea lions, can breed on land, on ice or in the water, and move and communicate from small to medium distances. Human-produced sounds complicate the sensing problem by adding sounds to what can be a very noisy environment. The use of passive acoustic monitoring is increasing as improved reliability and lower hardware and software costs provide researchers with a set of tools that can answer a broad range of scientific questions. This information can, in turn, be used in conservation management and mitigation efforts. While most of the new technologies have been applied in studies of whales and dolphins, the researchers say the sensors can also be used in studying pinnipeds, sirenians (manatees and dugongs), and fish.